Newcastle Art Gallery want to let you know that they want your kids to come over. Far from a prissy friend who scoffs when your children enter the room. They are welcome into the Newcastle Art Gallery any time next year and particularly during these school holidays. Book in for your workshop here. All children from the ages of 5 to 12 are invited to come along and workshops are Free - $12. Art Cart grounds the child’s experience of the Gallery with tactile, hands-on experiences. Parents are encouraged to collaborate with their younger children and encourage their older children to extend the art activity with some new element of their own design. Activities can be simplified or made more complex depending on the child. Each activity takes approximately 30 minutes to complete, and we ask that you arrive no later than 12:15pm to ensure there is enough time to complete your masterpiece. 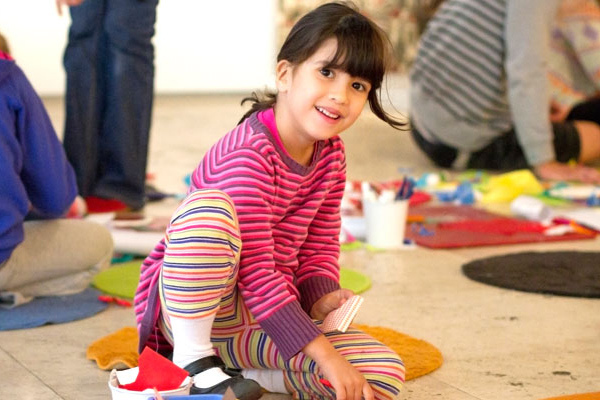 Newcastle Art Gallery is a hive of activity these school holidays, no whispering necessary! Tour through THE ERSKINE PLEDGE: a gift to Newcastle exhibition, be inspired by the 49 new works of art on display, and create your own personalised art apron to wear in future art-making endeavours. In this fun 1hour workshop, children will get to paint their own colourful patterns and designs. Tour through OLSEN ORMANDY exhibition, learn about the artists Louise Olsen and Stephen Ormandy, and make your own geometric necklace using paint pens, wooden beads and coloured wool.